Ever since news broke out that legendary director K Vishwanath has been bestowed with the prestigious Dada Saheb Phalke Award for his contribution to cinema, the entire Telugu and Tamil film industry united to congratulate the director. Yesterday, NTR, Rakul, Kalyanram and several other actors called it a ‘proud moment’ for Telugu cinema. 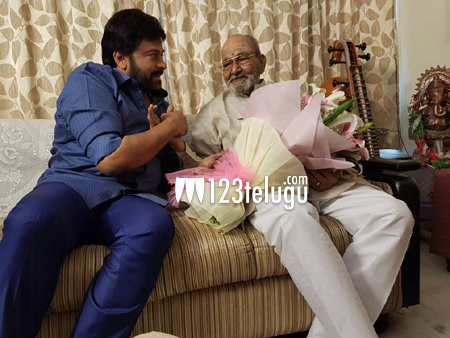 Earlier today, Megastar Chiranjeevi went to K Vishwanath’s house to wish him personally and also spent some time with him remembering their good old days. The two had worked together in 80s and 90s on films like Subhalekha, Swayam Krushi and Aapadbandhavudu. Meanwhile, Pawan Kalyan too is expected to meet Vishwanath and honour him for winning the award.